A homebrew club in Chicago has created a “maker” space for brewing beer — a dedicated brewhouse. There is a yearly Chicago Homebrew Club Competition sponsored by Bell’s Brewing called Hoptacular and this took second place in 2013, but still a C.H.A.O.S. club favorite and re-brewed several times. We have done lightly rested Bourbon Barrel versions as well. Since our club are located one mile from ground zero of where all Bourbon County Brand Stout is produced (Goose Island’s Fulton & Wood Brewery, http://www.gooseisland.com/fulton-wood.html) it is only natural that we have a homebrew recipe of our own. This recipe has been tweaked over the last four years to produce phenomenal results . . . as long as O.G. is achieved! If you want to make a truly local beer, try sourcing locally-made malt. 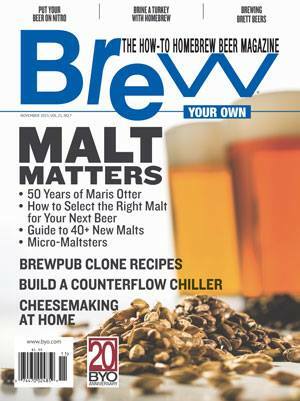 Four pros discuss craft malting. One style that’s making a comeback here in the United States is Baltic porter. Although it can be brewed as a lager, many breweries have adapted to fermenting with ale yeast, which works well for this style. While the Maibock whistles a sweeter, simple song, doppelbock comes at you full force. There’s no holding back malt flavor, aroma and complexity with this style. Recipe courtesy of Aaron Hyde.